The only thing better than chocolate dipped strawberries is whipped coconut cream filled ones. This non-dairy cream filling provides a healthy dose of yum to a variety of desserts. This recipe only has a few ingredients and if they are not common staples in your kitchen yet, they are likely to become so before too long (at least if you’re trying to replace refined ingredients for real food treats like these. Liquefy the coconut butter first. If you don’t, the ingredients will be too thick to mix well together. Place the jar of coconut butter in a pot of very hot water for 5 to 10 minutes. Once it has softened, stir it together well. It should be the consistency you see here. I used a melon ball tool to core the strawberries to make room for extra filling. 2 cups dark chocolate chips or bar (60%+ cocao) or for a raw version use chocolate crackle recipe. Use a small bullet type blender and add the coconut butter, coconut cream, and raw white honey or maple syrup. Blend until smooth. Add liquid stevia to taste (use as little as you can). The mixture will be quite runny at this point. To thicken it up, keep the mixture in the bullet blender or transfer to another container and place it in the freezer for 15 minutes and then transfer to the refrigerator for maybe 30 to 45 minutes until it thickens to the right consistency. If after 45 minutes it has not thickened up, add a small amount of coconut butter and blend it in the mixture. The coconut butter will thicken it up while honey and coconut cream will thin it- just so you know. While the mixture is in the refrigerator thickening up, get the chocolate chips starting to melt by either using a double boiler over low heat or using a special chocolate melting pot. Wash strawberries and cut off the leaves with a straight cut. Core the center of each strawberry with the small end of a melon baller or use a paring knife. This part is not essential. I made these once without coring them and the cream filling successfully stuck to it so you decide. Make sure the strawberries are dry by patting with a towel. 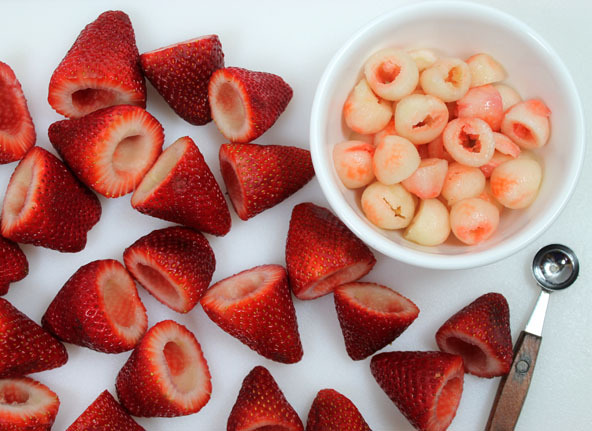 Place strawberries on a cookie sheet and place in the freezer for 30 minutes. Chilling them first makes this work so much better. Don't freeze them, just chill them. If you're thinking plenty ahead of time you can chill them in the refrigerator. When the cream mixture is the right thickness, Scoop some into a frosting bag with desired tip. If you don't have a frosting bag, you can fill a baggie with cream, zip it shut and snip off part of the corner to squeeze the cream out of the bag. Take the strawberries out of the freezer and begin to fill the cavity of the strawberries with the cream filling. Set the cream filled strawberries on their sides on the cookie sheet. 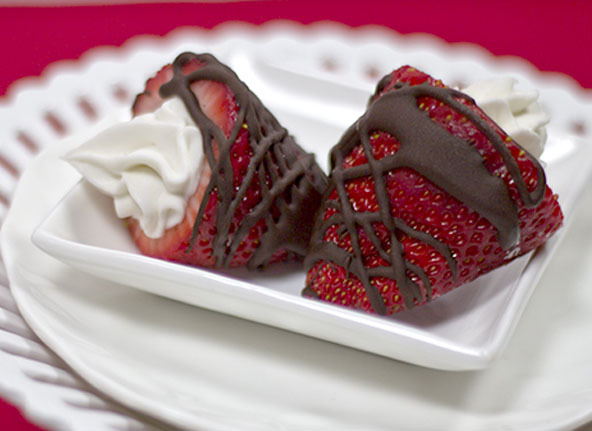 Drizzle chocolate over the strawberries with a spoon or for better results fill a baggie and snip off a corner and drizzle the chocolate on or use a frosting bag. Next place in the refrigerator until ready to serve. It’s important to understand the difference between coconut butter and coconut cream. 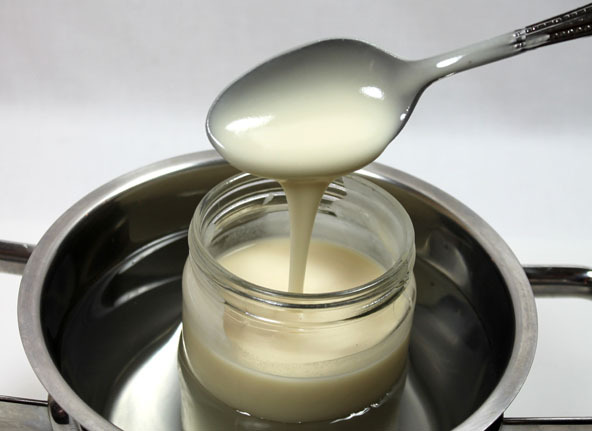 See the article “Making sense of coconut products” so you don’t get confused about conflicting names such as coconut cream concentrate and creamed coconut. See how to easily make Coconut butter here. It is usually solid and needs to become a liquid for this recipe. Purchase coconut cream in a tetra pak at an Asian supermarket. Or use the coconut cream found in a can of coconut milk. Purchase a can of coconut milk (you may need two cans for this recipe, each can has a different amount of cream) and place in the fridge for at least 4 hours to separate. Open the can and carefully scoop out just the top cream layer, leaving the liquid portion. Be sure to use the remaining liquid for soups or smoothies. Due to the melting nature of the coconut oil in the butter and cream, be aware of the temperature when working with and serving this special dessert. Be sure to keep them cool or even cold. You don’t want the chocolate to melt either. 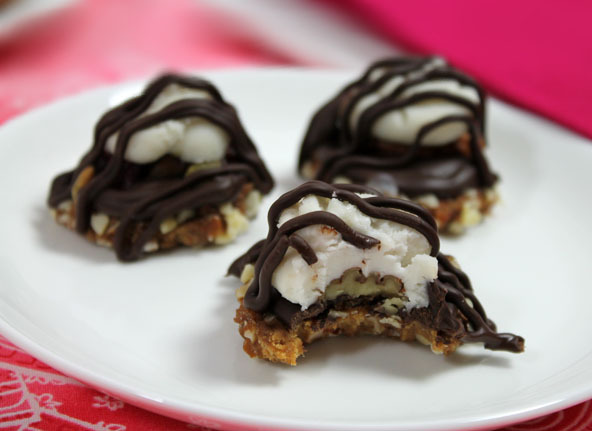 This recipe for Coconut Creamy Filling is also a great addition to my “Love Ya Back” Candy recipe.